Heavy Duty Plastic Clamping Jaws Protectors compatible for use with some Metal Clamping Jaws fitted to some Hofmann Megaplan make of Tyre Changers. 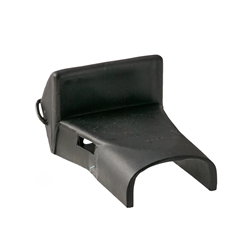 This Jaw Protector has a metal wire clip to the rear - see image. E4G 4402321 Hofmann Megaplan Plastic Clamping Jaw Protectors..